"Ron and Laura were awesome! Ron's epic writing and Laura's Gamification skills combined with the peaceful warrior meditation and their wonderful attitude made this a successful, productive and great adventure for all of us. We would recommend The Creating Good Work Initiative to any NGO looking to benefit from the skills and contribution of these wonderful people." "Ron Schultz and Mark Allen led our Envisioning team through a highly valuable 1.5 day workshop on mindfulness and innovation. On Day One, we explored a variety of different meditation practices that taught us to be aware of our attention and how to quiet our minds in order to create space for the inception of new ideas. On Day Two, we incorporated these techniques into a team brainstorming session where we learned how to create the space for emergent ideas together as a team. We learned a lot from these experiences and came away from the workshop motivated to integrate innovative mindfulness practices into both our personal and professional lives." 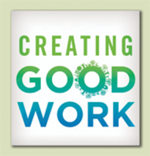 The Creating Good Work Initiative founded by Ron Schultz and Laura Sanderford allows self-sufficient volunteers to dedicate 3-6 months a year to bring their knowledge, expertise, and wisdom to social entrepreneurial and non-governmental organizational efforts in marginalized communities around the world. Its founders, recognized authorities in educational curriculum and development, leadership, organizational culture, and meditation and mindfulness, help organizations better educate and more effectively reach the communities they serve. During the 6-9 months Ron and Laura are not working directly with organizations in the field, they facilitate this process for others who want to follow a similar path. Because of their years working internationally with social innovators, social entrepreneurs and their social enterprises, the Creating Good Work Initiative is well-positioned to connect people with organizations already doing good work, but who could benefit from the added expertise of our CGW professionals. The idea for this Initiative is based on our book, Creating Good Work – The World’s Leading Social Entrepreneurs Show How to Build a Healthy Economy (Palgrave Macmillan, 2013) and our Internet-based TV series, Creating Good Work, Live. THE CREATING GOOD WORK, YouTube Channel is now Live!